All you can eat sushi buffet? Welcome to Sushi X 11 in Stamford, CT. This place is a true find if you are a sushi lover and like a lot of it! Fresh fish, excellent service, and very reasonable prices keep everyone coming back for more. Let us not forget to mention that you can also end your meal with an amazing homemade “Red Bean Ice Cream.” We recommend the Tuna Tartar which is prepared with the tempura flakes in the shape of a heart and topped with Mango and Spicy Mayo or any of the Special Rolls. 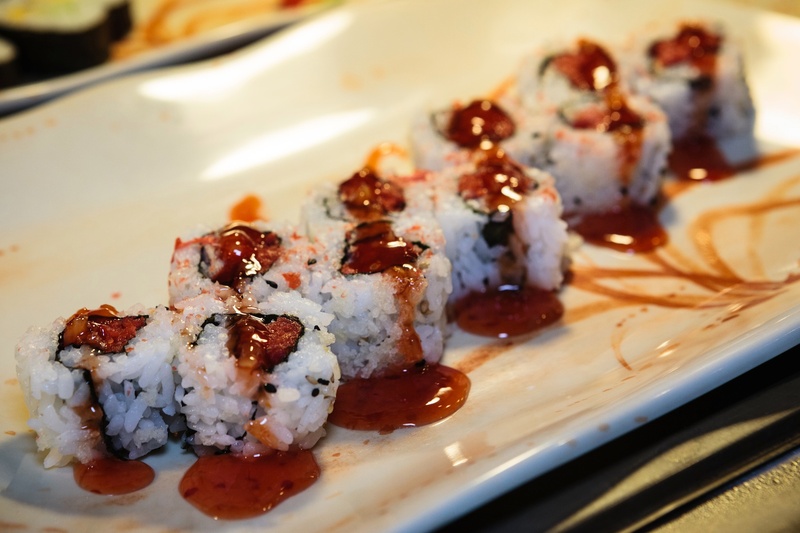 Don’t take our word for it…stop in and experience great sushi in abundance! We love this place and are confident you will too! I think for the price it’s okay but I’d rather pay more and know I’m getting the best quality sushi…especially now with the radiation and pollution in our water. This place is awesome! All you can eat for about 23-25 dollars. It may not be the highest quality, but it’s pretty darn good. Now the all you can eat will get you stuffed. You must finish the selected orders before ordering more sushi rolls. The all you can eat includes appetizers including soup, salad, wonton, chicken etc. Abundance and delicious rolls and speciality ones as well. BOMB! It also includes tea and dessert…try the red bean AMAZING! The waiters are very attentive and very nice. The waiting time isn’t very long even when they are packed either. Oh and the parking is free, just have the front stamp it before you leave. I’ve been here a dozen times and each time I leave stuffed and happy! Haha it is a great place folks. Sushi buffet may sound a bit fishy, but that’s the point right? Lmao it’s legit ct! Don’t listen to yelp…bunch of lies! All you can eat really? I dunno I have to see it to believe it. Could be interesting. It’s legit. Really good sushi and you get quite a bit for the price. Good if you want to eat a lot and get full. Sushi tends to be light and I never feel satisfied. May have to check this one out although all you can eat sushi sounds a little fishy lol get it? For the price you can’t beat it. It’s fresh and you get enough to fill you up. I’m rarely satisfied when I eat sushi…portions can be small so this was a nice treat. For sushi lovers, this might very well be the best bang for your buck! Definitely worth the price for an all you can eat. I was very impressed! This place was awesome! I went with my boyfriend after someone suggested it to us. We both love sushi and all you can eat certainly doesn’t hurt! The food was delicious and the service was so friendly we will definitely be coming back soon! Amazing in every sense of the word. Forget the Yelp reviews you’ve read….complete bs. Haven’t been here yet but sounds amazing! Will have to get my bf to take me! Looks yummy. This has become my favorite sushi place to eat lower Fairfield. Always fresh and always affordable. I used to live in California and this has been the best Sushi I’ve found in Stamford. There are some other good places in Fairfield, but this one gives you the best bang for your buck. I’ve read bad reviews on Yelp but I am sure it is purely competitors that write these comment. I love this place and I know Sushi. Go see for yourself. You’ll be quite happy.